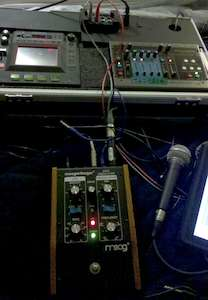 This was the setup for "Fried, a Night" -- my Kaoss Pad and EHX 2880 in their customized case, and a Moog ring modulator. The harmonica was a very low F, played into the Shure SM58 in the photo, which is plugged directly into the ring modulator. I’m wiped out after a long week of travelling and running around and wrestling with uncooperative software. But in my travels I acquired another analog synthesis gem, a Moog ring modulator. It’s hard to explain exactly what a ring modulator does, but you can hear it all over the harp on this new piece, , which is entirely harmonica. The background is a drone played on a very low F harmonica, layered and looped in the Kaoss Pad. The lead parts are the same harmonica, played in the higher registers. I really like the textures of this one. I’m playing the harp very gently, and low harmonicas are gentle to begin with. You can’t get a very hard attack with them; the reeds are large and take a moment to start moving. There’s a lot of room for expression on the low harps, which you’ll hear if you listen carefully to the bass drone. But that gentle playing gets a very hard edge from the ring modulator, a combination I quite enjoy. So, ring modulation. They call it that because it often produces bell-like sounds. Basically it combines two different sound waves — its own internal oscillator tone and an external sound, in this case the harmonica — generating an entirely new sound that emphasizes some harmonics of the original sound while eliminating other harmonics. Here, the combination produces the sharp glassy tone you hear on the harmonica in this piece. The ring modulator is applied to both harp parts — somewhat subtly to the bass drone, with the oscillator frequency rougly tuned to the drone note, and very aggressively to the lead part, with a high-frequency oscillator and quite a bit of LFO modulation, which I’m managing with an expression pedal. The only other effect on this piece is a layered delay on the Kaoss Pad. I looped the drone and some of the lead riffs into the KP’s sample banks, and let them repeat into the EHX, which is running a fairly long loop (30 seconds or so) with a gentle decay. In any case, this is my first contribution for a while to ImprovFriday, and I am looking forward to hearing how it fits with everyone else’s contributions.